Formed in 2012, the Manchester Royal Exchange’s Young Company is the producing theatre’s resident company for artists aged 14-25. It trains 110 young people every year and features young directors, digital content creators, performers, producers, technicians and writers. Impressively, each year’s cohort is representative of the 10 districts of Greater Manchester, with a third of participants from black, Asian or minority ethnic backgrounds, 6% with a disability and many from low socio-economic backgrounds. Funding is available for career development. Over the year, members take part in 170 sessions and five full productions. In 2017, 28 Young Company members also featured in community ensembles across three main-house productions. More than three quarters of participants have gained employment or continued training in the creative industries with several working on productions at the Exchange: Yandass Ndlovu performed in Jubilee  and Josephine Hepplewhite was movement director on The Suppliant Women. Writers from the scheme have been longlisted for the Bruntwood Prize for Playwriting  and alumni have appeared in Hollyoaks and worked in theatres including Hull Truck  and Oldham Coliseum , as editor of website A Younger Theatre and on the BBC Politics Show, and at Warner Bros and Polydor Records. This was a particularly fine year as the company’s production of Nothing by Amanda Dalton was recognised at the Manchester Theatre Awards . Based in Glasgow and with alumni including Hollywood star Gerard Butler, the Scottish Youth Theatre has been creating work by, with and for young people across Scotland since 1977. To celebrate its 40th anniversary in 2017, it launched a new National Ensemble for Scotland, auditioning young people aged 16 to 25 from across the nation to take part. No registration or audition fees are charged – its 21 participants are selected purely on ability. The company worked with physical theatre company Frantic Assembly to develop participants’ theatremaking skills and in August produced its inaugural production – Dye in the Goldfish Bowl – which received a four-star review in the Herald . Clearly, the group had been paying attention during its sessions with Frantic Assembly , with the Herald observing: “What was most striking about the devised piece was the way specific movement was incorporated into the characterisation, as if these people are stuck in a loop unable to escape their captivity or destiny. SYT’s achievements in 2017 were especially impressive, given that they happened despite the company failing in its application for regular funding from Creative Scotland . 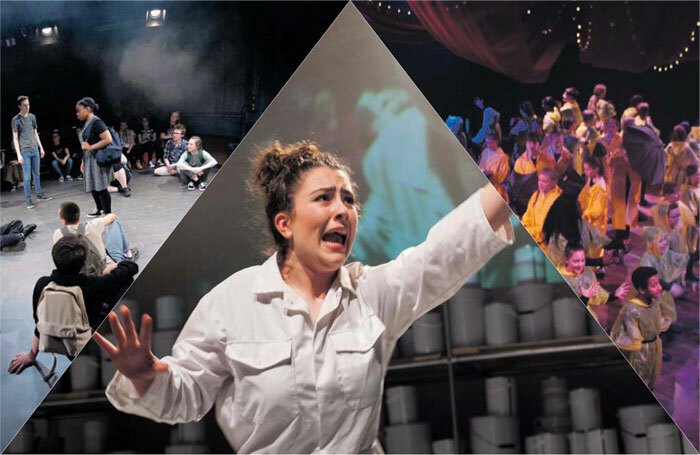 The English Baccalaureate – and specifically the lack of arts subjects within it – is a long-term and growing concern for theatre and the wider arts industry . Employers have repeatedly warned that the introduction of the EBacc will diminish the take-up of arts subjects in schools, leading to a skills shortage and threatening the development of future audiences. So, The Stage Awards judges were heartened to hear from Sandringham School , an academy school in St Albans, which has a strong focus on the arts and works with the industry to give its pupils the best possible arts education. The secondary school celebrates dance, drama, music and visual arts in its yearly arts festival in July. This year’s Sandringham Arts Week  included workshops from Rambert Dance Company  and dancers from the musical Hairspray, outdoor performances in conjunction with the Pauline Quirke Academy  and screenings of theatre productions by Digital Theatre . School productions created by the students have included Annie, Les Miserables and Guys and Dolls, with pupils appearing on stage, performing in the orchestra and running the technical side of the show. In August 2017, it was awarded the platinum Arts Mark by Arts Council England in recognition of “its passion and dedication to delivering high-quality arts and culture experiences for its pupils”. Meanwhile, showing that the arts help contribute to a well-rounded academic education, it has consistently been recognised as outstanding by Ofsted.